Last evening Scott and I went to the Shaw Client Consultation meeting that was held in Langley (BC, for those who don’t know which province we live in). Sandwiches and refreshments were provided, which was appreciated by those of us whose “to do list” prevented the consumption of a proper dinner. As I admitted last evening, I am a Shaw fangirl, and I don’t have a problem admitting that. I’ve had the Telus experience, and Shaw is heads above them for service. That said, when Shaw quietly removed 25gb from my internet plan, without telling me while still charging me the same money, the Corporation lost pretty well all of the trust I had for it, and Shaw is going to have to work very hard to get that trust level back. Do I believe that Shaw understands it has made a huge mistake? Yes, I felt that Chris Kucharski, Vice President, Operations, who led the meeting, was sincere when he stated such. Do I believe that Shaw wants to work with its customers to find a viable solution? Yes, I feel they do. Do I believe that everyone will be happy with the solutions? No, because you can’t please all of the people all of the time. As Scott said last night on the prospect of follow-up customer sessions – yes, we are interested in participating, but Shaw should do more of these sessions – don’t wait until there is a big problem – commit to holding more of these sessions to avoid the big problems. The first test for those at the meeting last night will come with their promised follow-up today of the congestion problem we are having. Yes, we are a super-user household, we have the Extreme internet package with three IP addresses, and we pay extra for that third IP. While I feel that $10.00 for that third IP is just a tad high when we get three extra IP addresses for our webserver down at SoftLayer for only $5.00, we need that third IP so we have to pay the piper for it. Periodic speed tests of our bandwidth, done at different times of day on varying days of the week are incredibly inconsistent, and rarely do we approach the advertised 15Mbps download speed, even at the off-peak hours between 4 – 6am. Yes, there are people awake in our house at those hours. There was some good dialogue at last night’s meeting, with some viable ideas on what to do about the data transfer and bandwidth speed issues. Except for the people who suggested throttling. That is a terrible idea, and is akin to locking a gamer in a dungeon with the golden key inches out of reach. We, like many others in the room last night, are willing to pay for speed IF there are either no caps, or caps that are better applicable to our plan – we have speed (when we’re not congested), and we want to use it. We do a lot of gaming in this house, and along with activities related to running this web site, we need a lot of transfer room. Three PCs, two laptops, two Xbox 360s, a Nintendo DS, a Wii, an iPhone and an iPod Touch need room roam. One day we’ll be able to afford a PS3, then what? More transfer usage. The current cap of 100gb simply is not enough. As I explained last night, two game packages downloaded and 1/3 of our monthly transfer allowance was gone. Gaming-related downloads in the billing cycle just ended resulted in just over 55gb of data, over half of our plan – and that’s just files, not game play. Who knows how much transfer we used up with YouTube, Facebook, Twitter or web-series watching, never mind emails and regular surfing around that big research facility known as the internet. People have asked me why we don’t switch to Telus. Well, let me tell you why. I refuse to sign a contract for telecommunications services of any kind. It’s bad enough I had to sign one for the cell phone service at work. Shaw’s customer service centres are located in Canada. Shaw does not out-source to countries halfway around the globe. They hire people who live in Canada. They support Canadian communities and Canadian enterprise with offerings such as the Shaw Rocket Fund – and yes, Telus supports projects like this too, in fact they are supporting this weekend’s Great Canadian Appathon – but they out-source and trying to get any customer support or technical service is very difficult, so Telus loses many points in the standings. Mr. Kucharksi asked if I thought Shaw was doing a good enough job letting Canadians know just how Canadian Shaw is, and frankly, no, you’re not. As I said last night, I’d like to see Shaw involved in local creative industry events like the Canadian Games Conference, the Canadian Video Game Awards and SIGGRAPH 2011, all being held in Vancouver – in fact this is the first time SIGGRAPH is being held outside the USA, and is a great opportunity for Shaw to do some good PR work. I know there are other creative industry events in your other markets that would offer similar opportunities for Shaw. Some of you last night were surprised to learn that Canada stands in third spot on the global scale as a digital media producer. Do not implement these horribly low caps and stifle that creativity. Canada is well on its way to taking top spot, let us innovate, create and educate without having to worry about monthly caps or throttling. We also learned last night about a new Shaw program, which was unveiled as I was writing this editorial. Called The Personalizer, I believe this new idea is meant to give Shaw users more of what they want, and as I said on Twitter earlier, it’s a step in the right direction, but I still have to buy a ton of channel bundles to get the few channels I want, along with many more I do not want. Also, if all Shaw users have to use this, including existing customers, it’s going to confuse the hell out of my parents, who are among the least tech-savvy people I know, and yes, they are Shaw Cable customers. We’re trying to get them to switch to digital phone and get internet at home, but that’s still a little ways off. My Mom doesn’t feel she needs home internet because she can look stuff up when she’s at the office, even though she’s retired and not supposed to be there. Personal TV includes over 40 of the most popular channels including 12 HD channels: CTV HD, ABC HD, CBC HD, Global HD, CBS HD, PBS HD, NBC HD, Fox HD, HGTV HD, CityTV HD, History, The Frame, MuchMusic, OMNI, Shaw TV, The Weather Network, YTV, The Shopping Channel, The Food Network, Game TV, Galaxie Music Channels, and more! What’s the “and more” is it TSN? A&E? Don’t give me “and more” I want to know what the “and more” is, thanks. A careful look at the two sports bundles does not show regular, plain old non-HD TSN. We don’t have an HD TV, so we don’t particularly care about HD channels. Where is APTN? Oops, wait a minute again…Spike TV is in with one of the Sports Bundles. Okay, so now we can’t watch the Spike Video Game Awards in the fall and Spike’s continuous running of the Star Wars saga, because that’s pretty well all we watch on that channel – unless we want to pay another $10.00 for a Sports Bundle, which we don’t. Bleh. So in the $10.00 bundle above, we watch amc (for The Walking Dead), Bravo, documentary and IFC the most, and have occasionally watched something on most of the other channels in that bundle which we might already have, except for Diva. Chick flicks are not popular in this house; we don’t watch WTV and OWN is not a necessity of life either. Anyway, back on track here. The next set of bundles are classified as Entertainment 1, 2 and 3, all priced at $10.00 each. Entertainment 2 pack we watch The CW, WGN CW, TV Tropolis, Comedy and once in a very seldom while, Slice. I already talked about Entertainment 3 – we watch Book and Bio. I think we have Bold now, but didn’t that used to be CourtTV? I can’t remember what replaced CourtTV when they took it away, maybe it’s now the Mystery channel. Needless to say, we will most likely not be getting Entertainment 3, and of the 26 channels in Entertainment packs 1 and 2, which will cost $20.00, we only actually want 14, maybe 15. CosmoTV? No thanks. Now let’s look at the remaining main bundles. We use timeshift, so that $5.00 bundle will remain, as will the Family Channels because I use them to check out some of our fine Canadian-made shows from studios like marblemedia and DHX, to name but two. 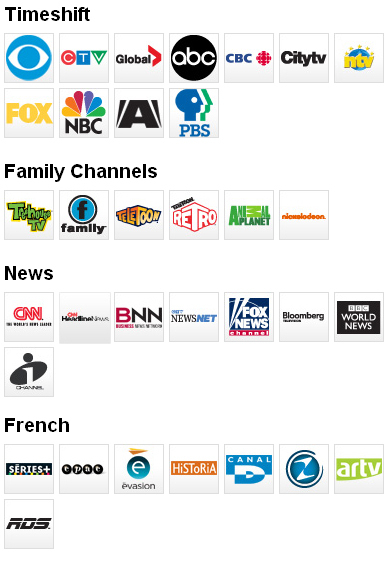 The News bundle will add another $5.00, but we don’t have to pay for all of those French channels. We’re not good Canadians, we don’t speak both official languages very well. Now over to the Premium Selections. I am going to presume that choosing the Movie Channel pack will still include the same channels we have now, like HBO Canada, which we must have because Game of Thrones will be airing on it. Movie Channel pack will stay, anything else in this group we don’t care about. We had the Super Channel pack briefly, but found we didn’t watch anything on those channels, so removed it from our subscription. We won’t be picking anything from the Multi-Cultural offerings, either. 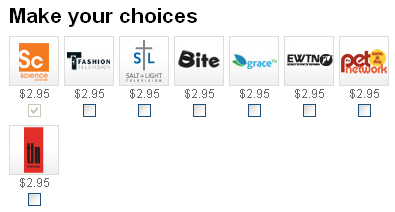 And in the final Television selection, we have Pick and Pay. We pick one – Discovery Science. If Shaw offered iDiscovery, we’d pick that too, but as we mentioned last night, even though Discovery’s web site says that Shaw carries this channel, it’s nowhere to be found on the menu. Please fix that. We want our forensics and crime documentaries, thank you. So, overall, we could maybe save money – we are currently on a PVR promo that doesn’t end until May 2013, and we do have a second digital terminal in the bedroom – I don’t know how to account for these on this new Personalization menu. The internet section won’t let me add our extra IP address – and almost every time something is updated on our account, our third IP goes AWOL. In fact, our third IP sometimes goes AWOL all on its own, and this is the only problem we have with Shaw’s customer service – they never see that third IP until they look closer at our account. It’s not like we haven’t looked at all of the options – business grade internet accounts, home server options, upgrading our internet package – we currently pay approximately 230.00 per month for phone, internet and television. The Home Server plan with only 200gb of data transfer for a server? Insufficient. We currently have 2000gb of transfer with SoftLayer, and the money we pay them each month includes data transfer, a whole slew of IP addresses and the server itself. But, when all is said and done – is Shaw offering these new cost-saving measures because many of us will be cutting back on Cable TV or digital phone due to the possibility of ugly transfer cap charges? I think I’ve made my position clear. No caps. I will pay for speed and help finance new or better pipes and community nodes, I will not have my usage capped and charged. I’m not thrilled that Jim Shaw makes more in two months on his pension than I make in a whole year, but I guess that’s the benefit of owning a huge corporation. Of course Shaw also has the advantage as Telus is our only other option in the area where we live, and well, Telus is simply not an option. So Shaw, it’s up to you to keep a long-term customer happy enough to become a lifetime customer. Are you up for the challenge? This entry was posted on Tuesday, March 8th, 2011 at 11:40 am and is filed under Editorials, National News. You can follow any responses to this entry through the RSS 2.0 feed. You can leave a response, or trackback from your own site. After nearly a decade, and after speaking to several friends and acquaintances, we are going to be giving telus a try…. why? and the very best of all…. Oh…. and the best part? When I inquire about concerns regarding speed, the information given to me isn’t just checked, but checked multiple times through various sources not just what they are programmed to say, but rather, talking to the rep gamer beside her and comparing our high usage family with his…. we don’t even compare. vancouversun.comUhm, Telus *does* have caps, and they *will* charge you for them. One example from the Telus site: 75 GB/month download/upload usage their High Speed plan. Shaw has shelved its UBB plans until after the consultations are done, and they are interested in working on some type of solution that will work best for all, at least that is the impression we were given last evening, and we spoke independently with enough Shaw representatives last night to have a little bit of faith in what they said. We have been over on our transfer cap two months in a row, and we know that had billing come into effect, we would not have been billed on those overages unless we went over a third month in a row, so to avoid that bill, all we’d have to do is stay under the cap for one month. Most of the data we used last month in downloads is because of PC game purchases and the fact that Michael reformatted his computer, and the men we spoke with last night are aware of that. Does the moratorium on UBB with Shaw mean we’re suddenly going to become epic super-users? No, we will just carry on as usual, there is nothing to be gained by suddenly abusing the system. We have never, ever had a problem with Shaw customer service, when we’ve needed service they’ve been there, and as an example, with the seeming congestion problem we’re having, a technician will be out tomorrow because Shaw has already run tests on our line, and it appears that the problem is between the house and the street, which is not surprising, because the cables are old and possibly all it needs is a new line. The important thing is that one of the VP dudes kept his word and had our service checked. Yes, you are getting three months to try the service, but make no mistake, you *will* be signing a contract, and just ask our dispatcher how expensive and difficult it is to get out of a contract with Telus. Suddenly the IBM computer she got wasn’t such a good deal. When we used to run LAN tournaments, Shaw was a sponsor of the last event we did. They gave us 10 modems, our own service tech to make sure all of the gamers were online, they installed the necessary internet upgrades to the hall we were using FOR FREE, and all of the data transfer we needed – plus some swag to give away. Conversely, a few years prior to that, we had to connect to Telus’ service in a different hall we were using. We had to BUY 2 Telus ADSL modems, and then when we were hooking up the gamers, all Telus support said – AFTER we waited on hold for almost an hour, on a cell phone – was…you can’t hook 80 computers up to one line. Oh yeah? Watch us. And we did. And they charged the hall for all of the transfer we used, too. That wasn’t pleasant at all. So, while you may be happy with the service you might get with Telus, we will stay with Shaw. spoke with telus the other day, guaranteed there is no cap because their optik line controls both internet and tv and because of that there is no way to differentiate between the two usages. Honestly speaking…. if you haven’t recently experienced Telus’ customer service I can vouche for how it has changed. Have called numerous times and no where near close to the wait time that I experience with Shaw, and we have a new PVR coming in free along with a set top box… It’s hard to base a comparison if you haven’t recently experienced it…. things have changed alot at Telus, they are the reason I stayed away from them for the past decade, and they are the reason I am switching and giving them a chance….. we’ll see how it plays out.